1810 had seen the Allies on the defensive, and Wellington had retreated back to the Lines of Torres Vedras near Lisbon, after fighting a successful delaying action at Bussaco. The 61st Foot were present at Bussaco, as was the newly arrived second battalion of the 28th Foot (2/28th), but neither took much part in the fighting. Marshal Massena’s starving and much depleted army had been compelled to retreat, and in 1811, the Allies resumed serious offensive operations. Meanwhile, on the Portuguese/Spanish border, Wellington had divided his forces in an attempt to seize the fortresses which were guarding the gateways into Spain. The 61st were in 6th Division and remained with Wellington’s command in the north, taking part in the investment of Almeida, as well as being spectators at the battle of Fuentes d’Onoro. In the south, 2/28th were in 2nd Division, where Marshal Beresford’s Anglo-Portuguese army with its Spanish allies was blockading Badajoz, when Soult’s relieving army attacked at Albuera on 16th May. 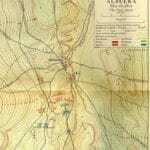 Picture: Map of the Battle of Albuera – The final French attack.